Have some awesome videos and want to transfer them to your sweet iPhone to enjoy on the move? Or you would like to convert HD videos to another format, either for backup or for uploading to YouTube, Facebook. By this, you need a video transcoder to carry out all these video conversion tasks. For MacBook Pro/Air, there are several video programs that you can use to convert videos. Among them, some of them are powerful, but come with a hefty price tag, while some are free, but is rather limited in functionality. Is there a Mac video converter that is both free and powerful? Take a look at this free video converter for Mac which can change video format free on Mac and cover nearly any situation you could find yourself in. Any Tool Worth a Recommendation? MacX Video Converter Free is strongly recommended! It can handle pretty much anything you throw at it and then spit it back out in a new format. It provides the easiest and smartest way to convert video free on Mac (macOS Mojave included). It supports transcoding among HD video formats like MKV, AVCHD, M2TS etc and regular video formats including AVI, MPEG, MP4, DivX, XviD, MOV, FLV, RM, RMVB, WebM, Google TV, etc. Furthermore, it also supports converting video to iPhone, iPod, iPad, Android Samsung HTC Sony, etc. Ultimate video processing freeware to convert video to MP4 MOV MKV AVI FLV WMV 3GP MP3 iPhone Ringtone, etc. 83X faster speed and Zero quality loss. Free download this video transcoder freeware and run it. Click "Add File" button to browse your computer hard drive and select files. It supports batch conversion, so you can import and decode several files at a time. 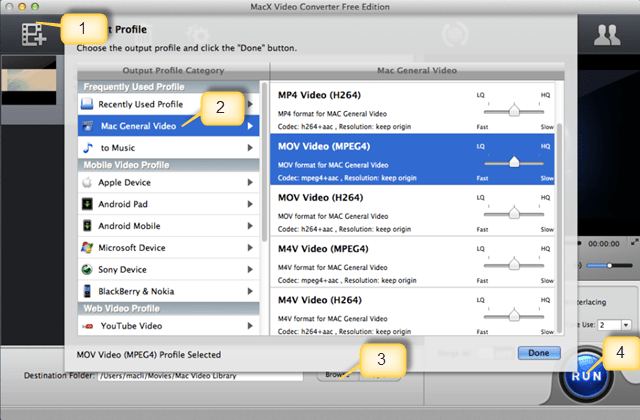 In the output format area, select MP4, MOV, M4V as output video format from "Mac General Video" category. Click the "Browse" button and choose the location where you would like to save your output files. Click "RUN" button and then you can just go out for a walk or take a nap, and the video conversion may have been finished when you come back. On top of the afore-mentioned video converter freeware to complete conversion task on Mac, you can also have a second choice - try on the new rising star Prism Video Converter. What are the features of this app? Below shows you the answer. • Be able to free convert video files from AVI, WMV, 3GP into AVI, ASF, WMV, MP4, 3GP. • Easy to use interface so as needless to consult the expert or tutorial. • Be compatible with both Mac OS X and Windows PC. • No mobile profiles provided. • Doesn't extent to other popular video formats and audio formats. • Conversion speed needs to be improved a lot.